With the coming of the fall movie season, there have finally been a couple of 2011 releases I was interested in making the effort to see in a theater. Last weekend I caught the baseball film MONEYBALL (2011), and today I saw the political drama THE IDES OF MARCH. Although my sense is that reviewers were more enthused with MONEYBALL, I thought THE IDES OF MARCH was the superior film. 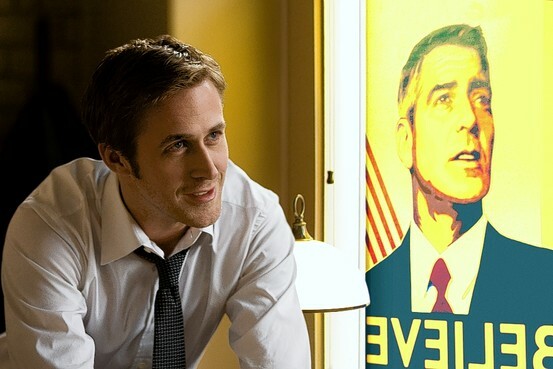 THE IDES OF MARCH stars George Clooney, who also coproduced, cowrote the script, and directed. 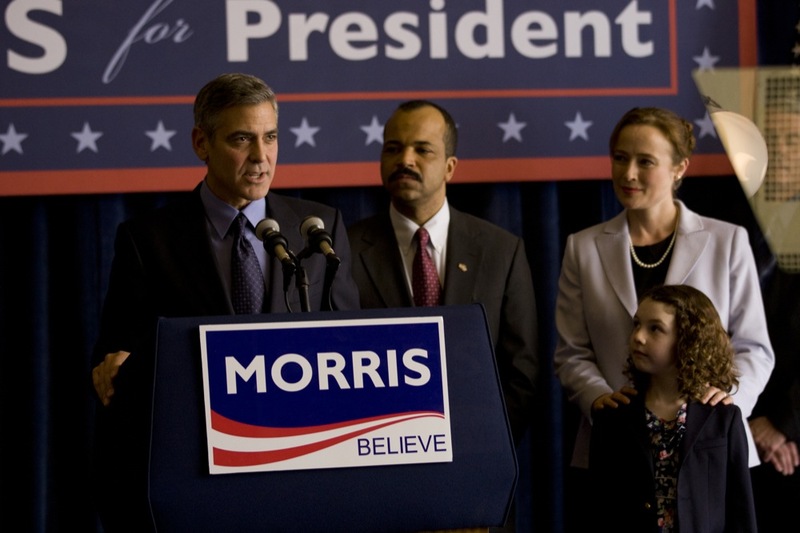 It takes place in a short time frame during a Democratic Presidential primary which pits Governor Mike Morris (Clooney) against Senator Pullman (Michael Mantell). The film centers on the machinations of one of Morris's chief political operatives, Steve Meyers (Ryan Gosling of THE NOTEBOOK), and the choices Steve makes, most particularly when he realizes that Morris, his political hero, has not been a faithful husband to his loyal wife (Jennifer Ehle, PRIDE AND PREJUDICE). It's an absorbing film which should appeal to those who liked Clooney's legal thriller MICHAEL CLAYTON (2007) or Washington dramas such as ADVISE AND CONSENT (1962) or SEVEN DAYS IN MAY (1964). Like those films -- and as is hopefully apparent from the title -- the movie is filled with intrigue and is, in part, a meditation on power and political corruption. Some reviewers have criticized the film for not being certain which story it wanted to tell or for ultimately not going much of anywhere, but I liked that it took a slice in time from a campaign, showed the characters and their choices, and let audiences draw their own conclusions. Clooney is excellent, sleaze dripping from every pore. I suppose there are some, like his eager young interns in the film, who will find his character admirable, at least for his political positions. But that's part of the beauty of the film -- each viewer will assess the characters and their choices, including political philosophies, through the prism of his or her own beliefs and values. Gosling is an up-and-comer who has starred in a handful of well-known titles; in addition to THE NOTEBOOK, his credits include REMEMBER THE TITANS (2000), BLUE VALENTINE (2010), and DRIVE (2011). He was Oscar-nominated as Best Supporting Actor for HALF NELSON (2006). This was the first of his films I've seen, and he more than held his own, in a very interesting performance; the viewer watches Steve transform from an idealistic, enthused politico on the rise to a manipulator who is every bit as sleazy as his boss. The film is populated with excellent actors in roles of all sizes, starting with Philip Seymour Hoffman. Hoffman played closemouthed field manager Art Howe in MONEYBALL, and here he's a completely different type of character, a veteran political operative. It's hard to believe the same actor played these two roles, as well as the CIA agent in another interesting political drama, CHARLIE WILSON'S WAR (2007). Evan Rachel Wood plays an intern; having seen her in the TV series ONCE AND AGAIN and the oddball Kevin Costner film THE UPSIDE OF ANGER (2005), it would be refreshing to see her playing a character who is not a troubled young woman. She seems to have cornered the market on this type of role. Paul Giamatti is an amazingly calculating opposition operative, Marisa Tomei plays a political reporter, and Max Minghella (THE SOCIAL NETWORK) is another of the governor's staffers. THE IDES OF MARCH runs one hour and 41 minutes. It was partly filmed on location, including in Ohio and Kentucky. Parental advisory: This film is rated R for very strong language as well as a hotel room scene between Gosling and Wood, which fortunately is not explicit. Abortion is also an issue, though it is never discussed directly. The film definitely deserves the rating. Incidentally, George Clooney has another film coming out next month, THE DESCENDANTS (2011), which could be interesting. 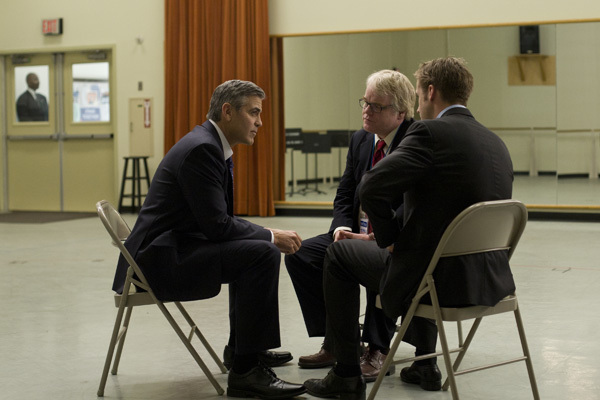 Additional reviews: Claudia Puig of USA Today gave THE IDES OF MARCH a solid three stars, while Kenneth Turan of the Los Angeles Times liked the acting and dialogue, but found the story lacking. I saw this one over the weekend as well. I liked it though wasn't exactly bowled over by the film's message - politics is cynical and our candidates have feet of clay. As if we didn't know this? But still, it held my interest and was really well acted, though I would have liked a scene between Philip Seymour Hoffman and Paul Giammatti. That would have been something to see. In my own case I simply liked it as a well-acted drama covering somewhat familiar territory. Sounds like we're probably on the same page in that regard. Glad you got to check it out too!